As friends of mercy Ephrata cared for soldiers after Braddock’s defeat and the Battle of Brandywine. The Mennonite preacher John Baer and his wife, who had come to help in the care of soldiers who were sick with typhus, died with the 150 soldier victims of the disease. With the best press and the only good paper in America they produced 43 books, the largest of which was the German <em>[[Martyrs' Mirror|<em>Martyrs' Mirror</em>]]</em> (in 1748) for American Mennonites. Their Ludwig Hacker had a Sunday school here 40 years before Robert Raikes’s in England. [[Miller, Peter (1710-1796)|Peter Miller]], the talented prior 1743-96, founded the Ephrata Classical Academy, translated the <em>Martyrs’ Mirror</em> from Dutch to German, and translated the Declaration of Independence into seven languages. In 1789 he interceded for the First Amendment to the Constitution of the United States which guarantees religious liberty, and freed a Tory, his worst enemy, walking barefooted to West Chester via Valley Forge, to appeal to General Washington. The State of Pennsylvania has established the Ephrata Cloister as a shrine, and is restoring all buildings to their original form. As friends of mercy Ephrata cared for soldiers after Braddock’s defeat and the Battle of Brandywine. The Mennonite preacher John Baer and his wife, who had come to help in the care of soldiers who were sick with typhus, died with the 150 soldier victims of the disease. With the best press and the only good paper in America they produced 43 books, the largest of which was the German <em>[[Martyrs' Mirror]]</em> (in 1748) for American Mennonites. Their Ludwig Hacker had a Sunday school here 40 years before Robert Raikes’s in England. [[Miller, Peter (1710-1796)|Peter Miller]], the talented prior 1743-96, founded the Ephrata Classical Academy, translated the <em>Martyrs’ Mirror</em> from Dutch to German, and translated the Declaration of Independence into seven languages. In 1789 he interceded for the First Amendment to the Constitution of the United States which guarantees religious liberty, and freed a Tory, his worst enemy, walking barefooted to West Chester via Valley Forge, to appeal to General Washington. The State of Pennsylvania has established the Ephrata Cloister as a shrine, and is restoring all buildings to their original form. Landis, Ira D. "Ephrata Cloister (Ephrata, Pennsylvania, USA)." Global Anabaptist Mennonite Encyclopedia Online. 1956. Web. 25 Apr 2019. http://gameo.org/index.php?title=Ephrata_Cloister_(Ephrata,_Pennsylvania,_USA)&oldid=129552. Landis, Ira D. (1956). Ephrata Cloister (Ephrata, Pennsylvania, USA). Global Anabaptist Mennonite Encyclopedia Online. 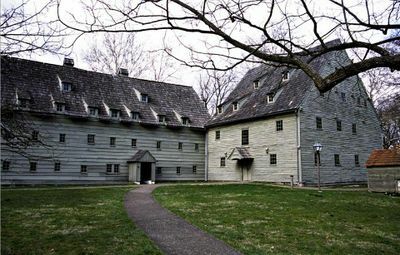 Retrieved 25 April 2019, from http://gameo.org/index.php?title=Ephrata_Cloister_(Ephrata,_Pennsylvania,_USA)&oldid=129552.